This is not a recipe for those who are looking to get dinner on the table in a hurry. That being said, despite the fact that it takes two days to make, this brisket doesn’t require a lot of hands on time and the results are well worth the wait. Plus, unless you’re hosting a dinner party, chances are you’ll have leftovers to make fantastic sandwiches for lunch the next day, (with pickles and grainy mustard). Did I mention I got to use the smoker? Oh yeah! I find a lot of people shy away from recipes that require planning a day in advance to start marinating the meat but once you’ve done it a few times, you’ll quickly learn that it’s not hard to do and adds a lot of flavour to the final outcome. This particular recipe is a bit different in that it calls for injecting the meat with a meat injector needle, I had quite the adventure with that one. In trying to inject the meat I managed to spray my kitchen with marinade, multiple times… It’s all part of the fun of playing in the kitchen though, because if things didn’t get messy, I wasn’t trying hard enough. Combine dry rub ingredients and rub into brisket. Combine marinade ingredients in a large measuring cup. Fill meat injector needle with marinade and inject the rub-covered beef brisket thoughout. Cover with plastic wrap and refrigerate overnight or up to 24 hours. Soak 8 cups of apple woodchips in water. Build a smoke pouch by squeezing the excess water from 2 cups of wet woodchips and place on a large piece of aluminum foil. Place 1 cup of dry woodchips on top and mix them together. Close foil around chips to make a sealed package. Using a fork, puncture holes in both sides of the pack to allow smoke to flow through and infuse the meat. Kake a total of 4 foil pouches. Place drip pan underneath one side of grill. Place smoke pouch on the opposite side. Turn heat on under the smoke pouch to 350F. Close lid and wait for smoke. Place brisket on cool side of grill over the drip pan. Close lid. Allow brisket to slowly smoke for 8 hours, change smoke pouches when smoke dissipates, (approximately every 2 hours). Remove beef brisket from heat, cover with aluminum foil and allow to rest for 15 minutes. Carve against the grain and serve on crusty buns with mustard & pickles. Posted by Brilynn at 12:27 a.m. I would agree with your title! Oh, I want a smoker so badly! The meat sounds heavenly! I love brisket -- in fact, I just made my grandmother's brisket recipe tonight, but in a slow cooker. Oh, it was good -- and leftovers definitely are the best part. I'd love to get a smoker for your brisket recipe. 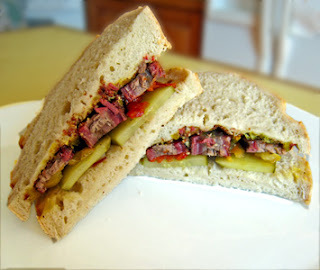 I keep reading about people using smokers, and the end results sound so good, Your sandwiches look especially good! Is the smoker enclosed or does the smoke escape? Do you do it outside, or is it like grilling indoors? Beef brisket is always, always worth the effort. Thanks for reminding me I haven't made it in a while.